The Bin is definitely NOT the right place for this one. Re: CONQUERSHIP (1v1 Map ) [April 12 2012] Graphic requests? Made a small change to the position of ships & targets. Any other requests to graphics? how can you wipe your opponent from a ship your not in? pamoa wrote: how can you wipe your opponent from a ship your not in? Sea cells bombard adjacent ship cells. "Receive +1 troop for every 5 sea cells held on your side of the map". Is there a way of programming this into the XML ? Even if there is, I would imagine it to be much simpler if the bonus was changed to "Receive +1 troop for every 5 sea cells". Or it could be even simpler if the whole bonus was given by the region count bonus; "Receive +1 troop for every 5 regions". But whatever, it's your map, and - assuming Victor_S is doing the XML - I'm sure he knows what's possible with the XML, and also what size XML file is reasonable given the gameplay. Actually, scrap that. So long as the other player can't actually conquer your ship regions, it should be possible with the current XML. That is an easy thing in the xml. You need to set up the sea cells as a set of continents and the ship cells as well. Then you just combine the two in a further continent for the bonus. Go and look at my Rorkes Drift xml to see how to do it. A tad long winded but easy to do when you work it out. The texture of the wood in the background isn't too pleasant, but you might be able to get away with it. Move this to final forge and we'll see how it plays ? ManBungalow wrote: The texture of the wood in the background isn't too pleasant, but you might be able to get away with it. I can tone that down a bit. ManBungalow wrote: Move this to final forge and we'll see how it plays ? 1. Each ship has one designated target on the opposite side. That target can still bombard any ship on the same side. 2. Ship cells can only assault their designated target. They cannot assault adjacent ship cells. #1 does to things - it makes it more difficult to gang up troops on first turn and take an opponent's ship (which would be unlikely, but not impossible). Second, it adds some intricacy to the assault strategies and a reason to have more than just one or two targets on each side. #2 makes the impact of a "Hit" more like the game. That cell is out of play once its hit. If ship cells can assault adjacent cells it will drag games on when you can just take back the neutral 1 each time. It really isn't needed, since the bonus only requires one cell of the ship. This makes it more realistic without really changing strategy. Re: CONQUERSHIP (1v1 Map ) [April 12 2012] Gameplay changes? No thoughts or opinions on this proposal?? How do I get to the sea cells? Are some of the sea cells starting positions as well? Do I need to go through the targets? And for this to be like the game, shouldn't the targets be able to attack ship cells on the OTHER side of the map (ship cells one way attack targets on their side of the map, which can bombard all ship cells on opposite side of map). I think the only attack option across the map should be bombard, just like in the game. I take control of the target on my side of the map, and bombard ship cells on the other side (which then can't be taken back, like your latest suggestion suggest). Also, if you plan on having any sort of decay or killer neutral on the targets, that needs to be mentioned in the legend. Regardless, this is pretty close to the stamp, so I will go ahead and sticky it. 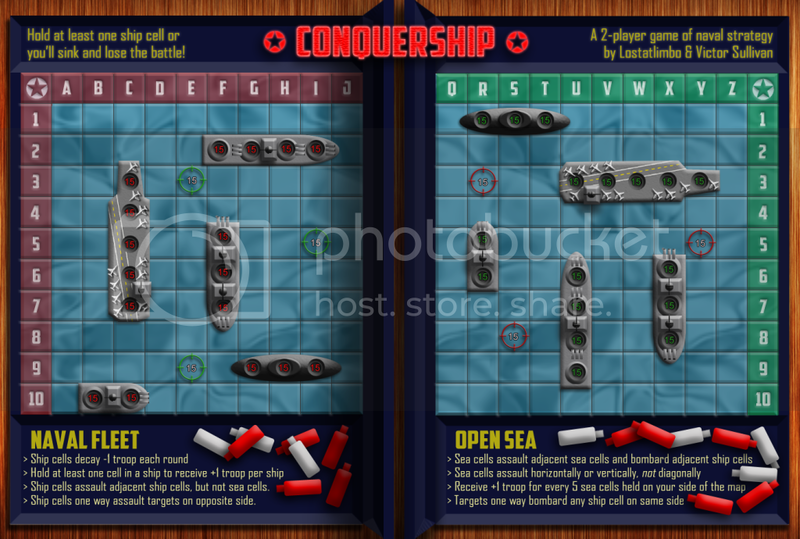 An idea that I just though of is to have the ships attack each other in a sequence, alternating the sides of the board. A-B-C-D-E and so on. Still have the targets and other elements but I can see this becoming stalemated if games go on too long. I'm not against either of these changes. #2 certainly makes sense. #1 I could take or leave. I'm sort of leaning toward the old way, since it would make things a bit easier on the player (as far as map comprehension goes), but I'm not against this change. Is there an update on the horizon with this one? I stickied it for the stamp, and then the thread went dead. nolefan5311 wrote: Is there an update on the horizon with this one? the last update is from 2 and a half months ago. The mapmaker posted on June 4th with some suggested GP revisions. Yeah, I was kind of just waiting for some more opinions on the gameplay changes, but if there's no objections, I guess I'll just move through with them. Gillipig, red ships assault red targets and red targets bombard green ships - likewise for green. This is the only way to 'cross over'. It is meant to emulate the action of 'hunting' for your opponent's ship in the original game. We're currently discussing the exact connections between ships and targets. Sully makes a good point about the current version's simplicity, but as you note, there is an advantage to going first that must be addressed as well. I'll try to get this updated shortly. I will also try some different backgrounds, per ManBungalow's request. Now that the strike is over, let's see an update on this one soon. That work for you limbo? It appears development on this map has stalled. Once an update has been made, let a CA know to get this moved back into the Foundry.